With the release of iOS7 and the new iPhones, it's all about colour in Apple's new revamp. There has been a widely mixed response to the new look and feel of iOS7, but the whole process has generally been a reductive one - simplifying layouts and interface elements. Where everything was once bezeled or polished and textured, we now have spans of empty space, light space, simple text prompts and subtle layering effects. The minimal clean lock screen for iOS7 has come in for a bit of criticism in its layout and how certain images will obscure items like the time or 'slide to unlock' prompt. I think to a degree that this forces us to think more about the images we use on these screens, and edit our images accordingly. In this tutorial, I'll show you how we can make the most of all this shiny new screen space, and enhance your images to create vivid, yet simple lock screen backdrops. First of all we need to think about composition. Before we edit anything at all, we need to think about the image we want to use, and how it fits into the portrait screen format. If you look at desktop screensavers, or indeed the pre-bundled images on the device, the structure of the images are generally simpler with tight crops on shapes and textures in a range of simple tones. Most screensaver images have a flatter tonal range in that they do not have areas of high contrast. This eliminates clashes with interface elements and helps the image to blend into the backdrop. That said, certain images with areas of high contrast when coupled with a simpler composition can make for really striking images and backdrops. Another area to consider is colour. Again, many backdrops opt for subtle colours, mixed with a flatter tonal range. Clashy colours, while striking can break up the layout of the screen and make things like icons and text difficult to see. And sometimes solid areas of colour, like high contrast can swamp overlaid elements so they are not easily visible. One positive aspect to this can be that the underlying colour scheme of your images does in turn have an impact on other areas of the whole iOS7 experience; in the notifications centre and control centre. And we can make this work this to our advantage, just as Apple intended. Using Geló we can take an image with varying levels of contrast and complexity and using simple colouring techniques make them into really cool lock screen images. Using belnd modes like the standard over setting we can intensify colour, neutralise tonal ranges and give images a graphic twist. Or you could try shapes to break images up into something more abstract. Multiple layered edits using a processed image can create patterns and abstract visual effects. I am actually working on layers for Geló so you need to save out and reload for now. 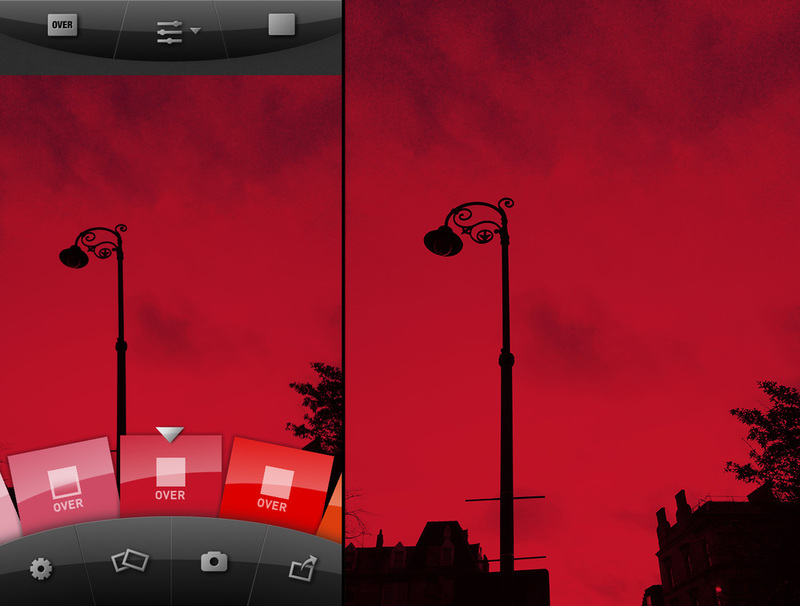 Take a look at the example images above and see for yourself how you can create striking lock screens with your photos. Don't be afraid to experiment! Download Geló today and try it for yourself. Your colours with your images. I was recently asked about the tutorials on the blog, and whether there was anything more suited to the beginner. This got me thinking that perhaps some of the terminology or subject in some of the tutorials were too focussed in a particular photographic style or effect. So going back to some basics, this quick tutorial looks at the different blend modes within Geló and the effect they have on images. The test shot is a good image to illustrate each effect - there's a range of tones, textures and solid contrast to show each effect. [one_half_last] The 'Over' (short for overlay) blend mode above adds a coloured gel having effect on the lighter colours within the image. Generally stronger colours like reds, greens and blues will override any other colours. Yellows, brighter tone colours like Cyan will appear 'thinner' over the image and some of the underlying colour will still show through. You can cancel this out by converting to monochrome, shown in the edit panel (shown) in the left-most pair of toggle buttons. The colour effect can be quite strong dependent on the subject, so contrast boost can help brighten the underlying image to make the overlay more vibrant. Moving on to 'Tint' mode (below) will add colour to existing tonal values, mainly in mid tones. This is a great way to enhance the colour of skies in daylight or at dusk. You can see below that the overall tone of the sky is still there, as is the texture of the clouds but it has an added colour quality. The original image is shown to illustrate the difference at the footer of this post. And to finish, the 'Add' mode (additive) colours the entire image, with most of its impact on the darkest parts of the image. This is particularly evident in strong shadows, and contrasty graphic shapes. Using contrast boost, can give a high key 'screenprint' effect as shown in this previous tutorial in the blog. And I'd love to see your images so make sure to tag them #geló on Instagram or on Flickr. I look on there regularly and if you need some inspiration do a search as there are some great examples out there in the iPhoneography community. I've found the images folks are creating to be really inspiring, and surprising in what they can wrench out of the apps features! If you're on Flipboard, be sure to check out Gelóscope - where I post some of my fave images I have found make use of Geló in their processing. Next up I'll take another look at the types of overlay shapes and gradients currently available in Geló. Using coloured shapes within Geló, you can great all sorts of effects. With a combination of blend modes, you can create multiple effects in areas that can break images up, and add new shapes as the result of overlaps. In this tutorial we'll look at this technique, of blending two shapes together with different blend modes. Let's start with an image that was initially run through Simply B&W. This allows us to increase contrast, remove colour and make the image more graphic in its composition. After loading in your selected image, select a bright, strong hue. Reds, strong green, vibrant blue or yellows will work best. Mid tone colours may not produce the results here but, as always it's good to experiment. Using a square overlay, we'll scale this up to full width of the image, and position roughly halfway across the image. Top or bottom it won't matter, and of course chose the composition that best suits your image. Render this over the image with an over blend mode and save. In subsequent versions of Geló you will be able to add multiple shapes in one edit. However in this first (version 1.0) this isn't yet available. Reload your saved image back into Geló (with the shape added) and select the same swatch you previously applied. This is best to try first as the colour is exactly the same, and will be positioned in the same area of the image. Reposition this shape so that an area of the gel overlays the already coloured part of the image. In essence so the two gels overlap. Apply this new position and select the add blend mode. You will notice in the image above that the blacks in the top area are coloured using this blend mode, and the lower area of the image, the over blend mode has affected the lighter areas, colouring them red. Save your image with this new combined blending. If you wish, you can add further effects such as gradients, other shapes to make your image different. In this example we've added a blue overlay just to deepend the red and take away the stark colour from the increased contrast. Try it yourself with shapes at angles, maybe similar colours for more subtle effects (such as a deep red with a burnt orange) or mixed with gradients.